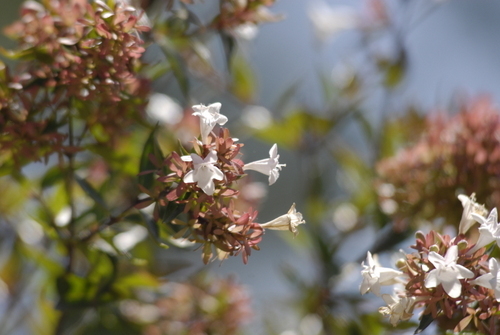 Abelia grandiflora with plain green leaves or variegated ‘Francis Mason’ have arching stems and tiny white bell-shaped flowers. Concealing parts of a garden with evergreen shrubs can make a small garden appear larger. Wild pomegranate (Burchellia bubaline) has glossy green leaves and clusters of bright orange tubular flowers loved by sunbirds. Mexican orange blossom (Choisya ternata) bears glossy green, fragrant foliage and scented white flowers in spring. Kingfisher daisy (Felicia amelloides) is a small shrub with blue daisy-like flowers throughout the year that is ideal for mass planting. Freylinia tropica has an upright growth habit and small leaves. Delicate white or mauve flowers attract butterflies. 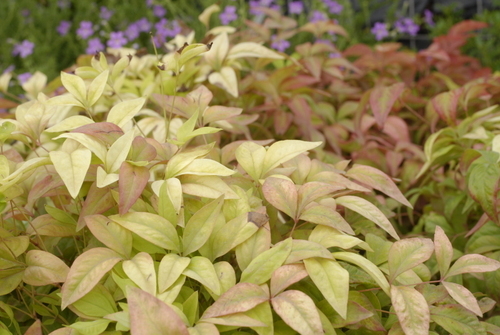 Sacred bamboo (Nandina domestica) and the dwarf cultivar ‘Pygmaea’ have bamboo-like stems and fern-like leaves that assume red shades in winter. Mickey Mouse bush (Ochna serrulata)has bright yellow flowers and colourful new spring growth that changes to glossy green. Flowers are followed by red calyxes holding black fruits that resemble a Mickey Mouse face. Polygala fruticosa is a small rounded shrub that bears purple-pink flowers in summer. Butterflies love the flowers. Australian rosemary (Westringia fruticosa) is an extremely hardy shrub with needle-like grey-green leaves and tiny flowers.